The American Eagle Silver Bullion Coin was first available from the US Mint in 1986 and offers investors and collectors a unique way to obtain a coin whose true worth is based on the value of the metal it contains. Typically, a coin's value is determined from its limited mintage, rarity, condition and age. In the case of the American Eagle Silver Bullion coin, it is mostly determined by the market value of the ounce of silver it is struck from. Silver being more affordable than gold and platinum, these pieces are favorites among many for their affordability and credibility. The Silver Eagle is considered legal tender of the United States and were the first silver bullion coins whose weight and purity were guaranteed by that government. In fact, the US Government allows investments in these coins to be listed as assets in personal retirement accounts. 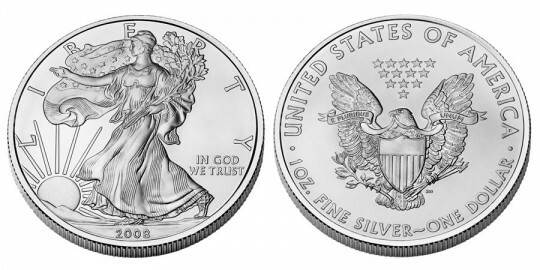 The Silver Eagle Coin is only available in one size containing one ounce of silver. Its face value is $1. The coins are not sold directly to the public by the US Mint, but instead are issued through its network of authorized purchasers. This network obtains the coins in bulk, then resells them in smaller lots to the public for a small premium above the current spot price of the silver they contain. For reference, 34,764,500 of the 2010-dated Silver Eagles were sold by the US Mint which was an annual record at the time for the program. Adolph A. Weinman's 1916 "Walking Liberty" half dollar provided the basic origin for the obverse design. That vintage coin is considered to be one of the most beautiful American coins ever minted. The obverse also contains the year, and the word "LIBERTY". The reverse comes from the work of engraver John Mercanti and contains a Heraldic Eagle with shield, meant to symbolize strength and endurance. Carried in the beak of the eagle are the words "E PLURIBUS UNUM". Also visible around the edge are "UNITED STATES OF AMERICA", "1 OZ. FINE SILVER" and "ONE DOLLAR".